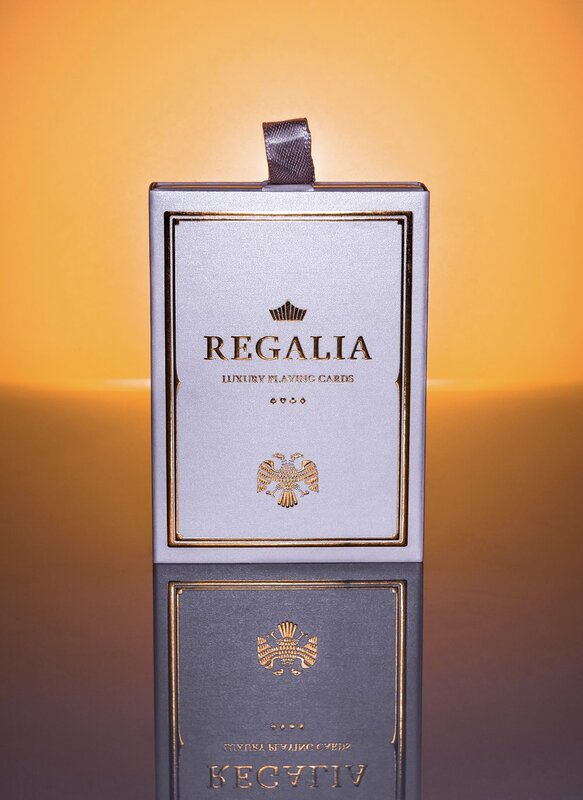 The second edition to the Regalia Playing Cards series. From the creative mind of Shin Lim and printed in Belgium by Cartamundi, comes a one of a kind deck which was first introduced last year with an overwhelmingly positive response. The box is made from two protective pearlized white casings, with an inner and outer cellophane wrap. These individually gold foiled cards are sealed to withstand any extreme heat or humidity during shipment. Our priority for the Regalia series has always been quality. Each card has been carefully hot stamped with gold foil and then protected with a true B9 finish, thus to not compromise the feel and fluidity with each shuffle or flourish. Created for the magician in mind, every card in the deck has been designed to look standard(with the exception of the Jokers and Ace of Spades). Subtle changes however has been added to the court and number cards. Such as minor details like the stem of the spade, to the borders of the face cards. Each small alteration gives a sense of elegance everytime you open the deck.